No this isn't a story from the mid-eighties that got mislaid. 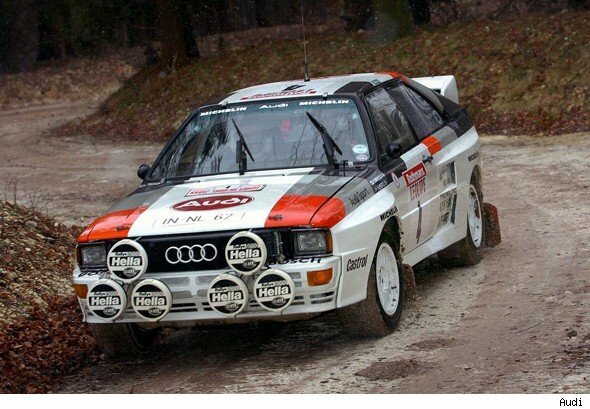 The "too fast to race" rally cars that were banned in 1986 are going to compete in a multi-stage rally in Cheshire in August 2012. Group B cars were fire-breathing monsters (literally spewing flames from the exhaust on nearly every gearchange), with up to 500 bhp. They were banned after two fatal crashes in 1986 in which three spectators and two competitors were killed. It was felt that the cars were simply too fast for narrow forest tracks with open access for spectators. The publicity photographs show all the Group B classic cars – Audi Quattro, Peugeot 205 T16, Ford RS 200 and even a Lancia 037. They are also promising a wide range of other cars, including WRC rally cars and historic classics. There is a nice looking Rover SD1 race car on their website, which suggests a pretty broad church of interesting motors. The event will take place on the weekend of 25/26 August and (a few) more details are available at the rallygroupeb website.